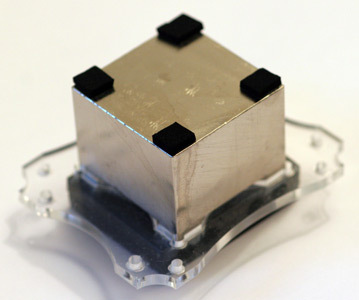 A solid piece of aluminium! Pads added here. As mentioned so many times before, the case is pretty packed so you have to remove almost everything when you need to do something with the motherboard. So the drive cage had to go out with the drives first. Unplugging some cables to make it easier to remove the motherboard is also adviced. Removed motherboard and removed the AOpen cooler. 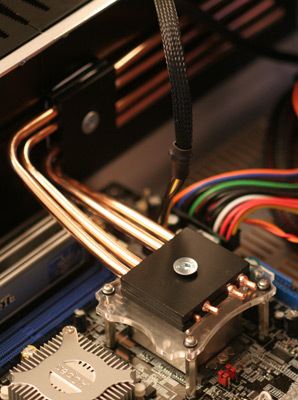 The Borg 479 Heatpipe cooler uses the original AOpen bracket that came with the motherboard. You first have to fasten the four screws through holes on the motherboard to the bracket on the underside. Each of them has a little rubber o-ring to ensure that there is no short-circuts or just being gentle to the motherboard. 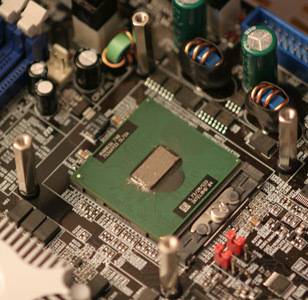 The CPU has to be cleaned so you dont have remains of the old paste on it, and then reapply a very thin layer of paste again. In my case I used Arctic Silver 5 which I have good experience with on my desktop. The rather heavy cpu block first needs some small foam pads on the edges to lower the pressure on the CPU when you tighten it to bracket screws. Then I put the CPU block on top of the CPU and fastened the long screws, with some rubber o-rings there too. Now, the biggest problem here is how far should you fasten the screws? Its obvious from the lenght of these screws that you can probably screw them all the way down and BREAK YOUR CPU! So I just tried to screw them a bit down and make sure that every screw was equally far down, hoping that there was enough contact with the cooler. I guessed that the performance of the cooling would show how effective it was. 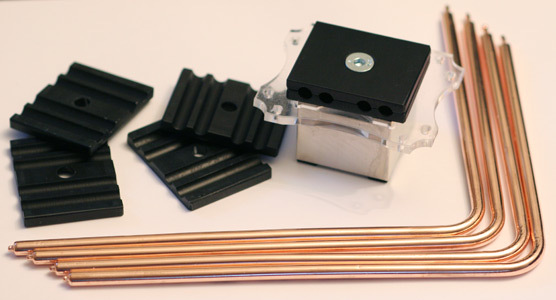 The whole cooler kit, cpu block, 4 heatpipes and 2 heatpipe brackets. The next part was the fastening of the heapipes. At first I thought that this was going to be difficult as there is no real way of fastning the heatpipes until after you have added them all and then used the brackets to hold them in place. But since you have to apply the thermal paste (supplied in the kit) you soon realise that the goop is so sticky that it can act as glue as you add the heatpipes. Naturally each heatpipe has to be bent somewhat to fit the bracket that is fastened on the side of the mCubed case, so its wise to do this bending before you start applying any thermal paste. I then used the paste, attached the heatpipes and fastened them with the brackets (also applying thermal paste on these). If you are a bit careful with the paste you dont have to make a mess, although it can easily get a bit gooey there. 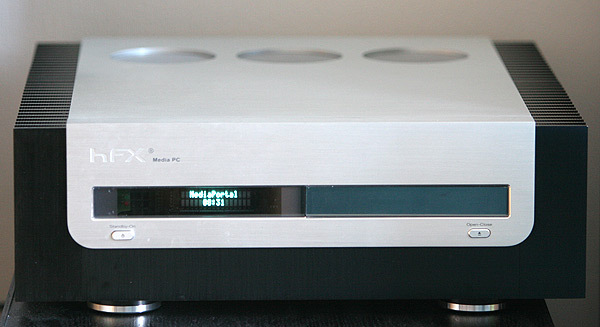 WMV HD playing in the background, very nice performance from the system indeed! The system booted to windows xp fine and silently and everything was running smoothly. 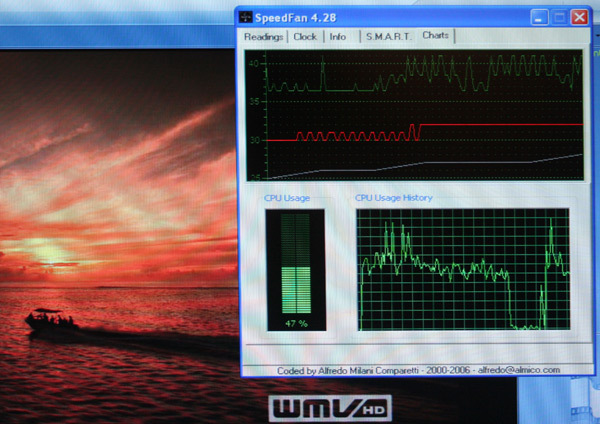 I immediately tried adding some load to the CPU by starting up a WMV HD (720 lines) in mediaplayer at full screen, and then checked out the temps in the SpeedFan application as well as the CPU load. As you can see on the screenshot, playing back a WMV HD uses around 50% of the CPU, and remember I am not using any hardware acceleration of VMR9 here - the graphics card is yet to be installed. The temps are very nice too, the topmost (green bar) showing the CPU at around 40 degrees, the system temp at about 32 degrees, and the harddrive slowly climbing (here at 33 degrees). The HD temp will keep on climbing up to 48 degrees, drawing both the system and CPU temps up a bit. Normally my CPU idles at 44 degrees after 12 hours. The temps depend a lot on if the hd is spinning or not. So I have set the power options to spin down the HD after 30 minutes of idling. Just have to make sure you dont have apps in memory that use the hd unecessarily. Silent running with MediaPortal frontend updating the VFD display. It is clear that this system is expecting better than I could ever have hoped. And there are still some things that can be done. I am considering swapping the drive for a 2.5" drive since they are more silent and run a bit cooler than a 3.5". In time when prices have come down I am quite sure I will swap this for a solid state based system, totally silent! Also, I have yet to install the GeForce 6600gt, and when I do I will also use a Borg heatpipe cooler for that. It will be awesome to be able to play some nice 3d games on this rig some day, although I have already tried running World of Warcraft with the onboard GPU, which works fine but with low details and effects as well as low fps. In a period of one year I am quite sure I can add a cheap card that will give me the performance of an XBox360 while still being a complete media center and general purpose PC that is totally silent!